Naidu's 'Dharma Porata Deeksha' (a day-long protest for justice), which began at 8 am, is likely to end at around 8 pm. New Delhi: Andhra Pradesh Chief Minister N Chandrababu Naidu's daylong fast demanding special status for his state on Monday became a rallying point for various opposition leaders who visited the protest venue to back him and attack the Central government. "Those who live in glass houses should not throw stones at others," he said. The PM said in his rally that Naidu was indeed a senior, but only in losing elections, switching alliances and ditching his father-in-law N T Rama Rao. “We will show the BJP its place in the elections. I assure you on behalf of Sharad Pawar ji,” Memon stated. Mulayam Yadav said he was not well but had come to show endorse Naidu's stand. "Naidu is fighting the battle for the poor, the farmers and all those who are oppressed," he added. Stating that Naidu was fighting for a just cause, DMK leader Siva said the Modi government would be ousted in three months. "The powers of the state are being encroached upon...the rights of the minorities are being violated." The TDP had walked out the BJP-led NDA last year protesting the "injustice" done to Andhra Pradesh after its bifurcation. The Constitution is being systematically destroyed, added former Arunachal Pradesh chief minister Gegong Apang, who gave the BJP its first government in the Northeast 16 years ago. 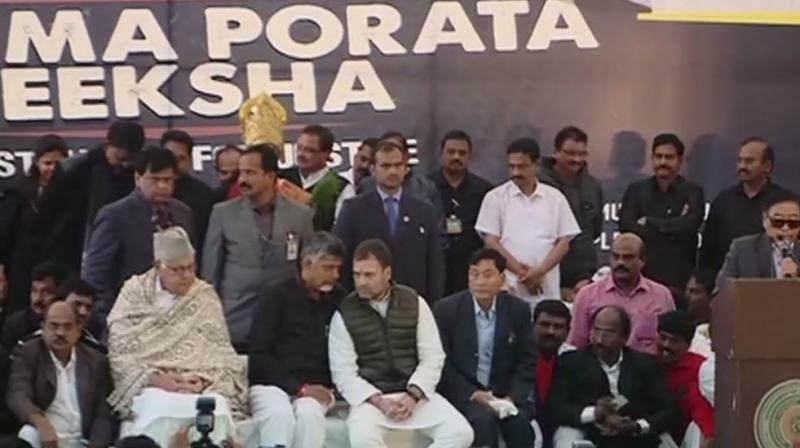 Congress leaders Anand Sharma, Ahmed Patel and Jairam Ramesh were also at the venue to express their support. Naidu's 'Dharma Porata Deeksha' (a day-long protest for justice), which began at 8 am, is likely to end at around 8 pm. He will also submit a memorandum to President Ram Nath Kovind on February 12. Naidu paid tributes to Mahatma Gandhi at Raj Ghat and also to the Ambedkar Statue at the Andhra Pradesh Bhavan before sitting on the hunger strike.